Cyprus joined the EU during its big enlargement round of 2004, as the only EU member state with part of its territory occupied by a foreign power. The northern part of the island has been occupied by Turkey since 1974, and a referendum on reunification based on the plan by UN Secretary Kofi Annan following the country’s EU accession in 2004, was voted down in the Republic of Cyprus. Due to its territorial division, Cyprus has so far not joined the Schengen area. Nonetheless, the country is closely integrated with the rest of the EU as it adopted the euro in 2008. The population living in the Republic of Cyprus is almost 855,000. Although this amounts to just 0.2% of all EU citizens (after Brexit), Cyprus sends 0.9%, or six MEPs out of the total of 705 in the European Parliament (EP). The turnout during 2014’s EP elections was 44%, in line with the EU average of 42.6%. The majority (52%) of Cypriots believe the EU is a good thing, while 14% regard it as a bad thing and 34% are indifferent. A bigger majority, 74%, also supports the EU and 65% feel like citizens of the EU. Nonetheless, only 42% are satisfied with how democracy works in the EU. Cyprus’s economy took a big hit during the euro crisis and was the first eurozone country that needed to impose capital controls in 2013 because of prolonged negotiations with the IMF, ECB and EU over a financial bailout programme needed to refinance itself. Capital controls ended in 2015 and Cyprus exited its bailout programme three years later, in 2016. Moreover, its economic growth quickly rebounded again. In addition, its economic momentum is expected to continue, according to the European Commissions’ latest autumn and winter forecasts. Cyprus’ economic rebound is confirmed by its 2014-2018 average annual real GDP growth figures, which were 2.8%, above the EU average (2.1%). Growth was most rapid in recent years (over 4%), and is expected to continue growing in 2019 and 2020 by 3.3% and 2.7%, respectively. Cyprus’s total GDP was €19.5 billion in 2017, 0.15% of total EU 27 (without UK) GDP. The per capita real GDP was €22,700 in 2017, still below pre-crisis levels and way below the €27,700 EU28 average. Its GDP per capita in purchasing power standards (PPS) used to be above the EU average but now stands at 85% of the EU28 average. Unemployment has halved compared to five years ago, and now stands at 8.4%, getting closer to the EU28 average of 7% (in 2018). Youth unemployment remains high at 20.2%, although the level was almost double in 2013-2014. Cyprus’ current political system was established in 1960, after the Greek and Turkish communities gained independence following a guerrilla war against the British rule and reached agreement on a constitution. Makarios III, a Greek Cypriot clergyman and politician, served as the first president of Cyprus (1960-1977), while also retaining his place as the Archbishop of the Church of Cyprus. Greek Cypriots widely recognise Archbishop Makarios as the “father of the nation”. The 1960 constitution remains in place, despite the island’s partition that followed the Turkish military invasion in 1974 and the subsequent occupation of the northern third of Cyprus, mostly inhabited by Turkish Cypriots. This happened following a coup d’état against Makarios by a Greek Cypriot paramilitary organisation and the military junta that ruled Greece at that point, with the aim of unifying Cyprus with Greece. Although the Republic of Cyprus is recognised as the sole legitimate state, the north is run by the administration of the self-declared “Turkish Republic of Northern Cyprus” and functions as a ‘‘de-facto state’’. Turkey is the only country that recognises the Turkish Republic of Northern Cyprus. However, this has been declared invalid by the UN Security Council, which has repeatedly confirmed in resolutions that the territory is the northern part of the Republic of Cyprus. Northern Cyprus is de jure part of the EU by virtue of formally being part of the Republic of Cyprus. It had been hoped that the accession of the southern part in 2004 would provide the catalyst for unification so that a unitary state of Greek Cypriots and Turkish Cypriots could join the EU on 1 May 2004. In the end, Turkish Cypriots supported reunification, in part because it would allow them to join the EU. However, the unification plan was voted down by the Greek Cypriots and Cyprus joined the EU as a divided island. To this day, the division of Cyprus has remained an intractable political problem plaguing relations between Greece and Turkey. In February 2014, renewed negotiations to settle the Cyprus dispute began after several years of warmer relations between the north and the south. The leaders of Greek and Turkish Cypriot communities, Nicos Anastasiades and Derviş Eroğlu, subsequently issued a political declaration expressing their support for renewed peace talks. The declaration was also welcomed by the EU. Nicos Anastasiades, and Eroğlu’s successor Mustafa Akıncı, the incumbent president of Northern Cyprus, met for the first time and restarted peace talks in May 2015. However, in July 2017, the UN-sponsored talks were brought to a halt after negotiations collapsed. 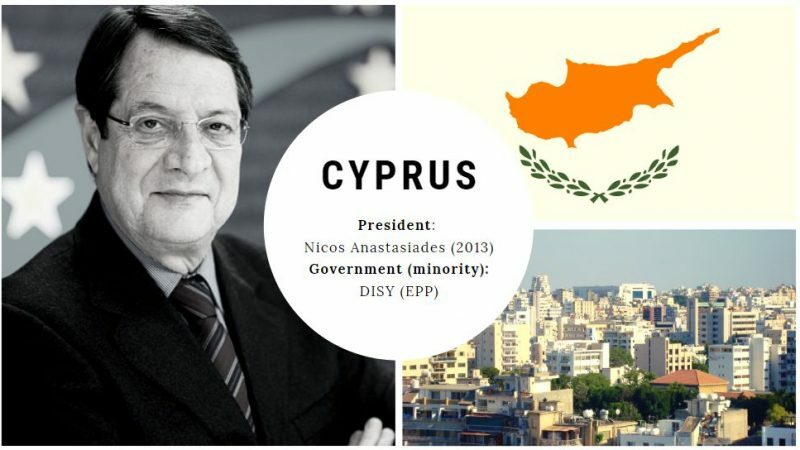 Cyprus’ ‘‘unitary’’ presidential republic is led by the president, who is both the head of state and government. Incumbent President Nicos Anastasiades from the DISY party has held office since 2013. On February 2018, he was re-elected for a second five-year term. Cyprus operates under a multi-party system, with the communist AKEL and the conservative DISY in the forefront. The centrist and nationalist DIKO and smaller parties often form a coalition with the President’s party and are allotted a number of ministries. DISY (a member of the European People’s Party, EPP) dominates the centre-right of the political spectrum in Cyprus. AKEL (a member of European United Left–Nordic Green Left group, NUE/GNGL) and DIKO (Socialists and Democrats, S&D) dominate the left and centre, respectively. AKEL criticises the EU’s “neoliberal” orientation but is not opposed to the EU as such. Like in some other European countries, nationalism in Cyprus has thrived on the back of socially deteriorating and politically fluid environment of the post-crisis period. In the 2016 elections, the ultranationalist far-right ELAM party, which was established in 2008 and has close relations with Greece’s Golden Dawn (initially it started out as a Golden Dawn branch) won two seats in the House of Representatives. ELAM opposes European integration and advocates a Europe of nations instead. More worryingly, however, it also promotes Greek nationalism and exhibits neo-fascist leanings. In February 2019, international oil and gas company ExxonMobil announced that it has made the world’s third biggest natural gas discovery in two years off the coast of Cyprus in the Eastern Mediterranean. Based on the preliminary interpretation of the data, the discovery could represent a natural gas resource of approximately 5 trillion to 8 trillion cubic feet. In this light, the EU is considering developing a gas hub in the Mediterranean to diversify its energy sources and reduce its dependence on Russia, which now supplies roughly one-third of the bloc’s gas. However, with reunification talks at an impasse, revenues from potential reserves remain a major sticking point, with Ankara insisting the subsea riches can only be shared between the two communities once a comprehensive settlement is reached. Altogether, Cyprus’ political scene remains dominated by the unification question, which has become increasingly complicated due to the recent gas discoveries and the tense political situation in Turkey. Despite compulsory voting, turnout at EP elections has been in rapid decline in Cyprus: from 72% in 2004 to 44% in 2014. Local problems dominate the public debate, notably reunification and the current crisis with Turkey over hydrocarbon exploration. The upcoming election will largely be about the race for the sixth MEP seat, which may go to the country’s far-right ELAM for the first time. According to the latest poll results, DISY is set to win 33% of the votes, while AKEL and DIKO get 26% and 15% respectively. Hence, DISY, AKEL and DIKO are projected to get two, two, and one MEPs, respectively, which will go to the EPP, GUE/NGL and S&D. Ultranationalist ELAM stands a real chance of getting one MEP seat. It’s unclear which European group it would join, if any. Currently, the party polls in fourth place, with the support of 8% of voters. Another left-wing party, the Movement for Social Democracy (EDEK) – which distinguishes itself from the other mainstream parties with its opposition to a federal solution to the Cyprus problem – will compete with ELAM for the country’s sixth MEP seat, as it currently polls closely behind with 7%. Ery Papalamprou works in Evaluation and Research of EU policies. She is an LSE Law graduate and a qualified lawyer, admitted in the Athens Bar Association.